We're ready to dig into letter D, so come on! 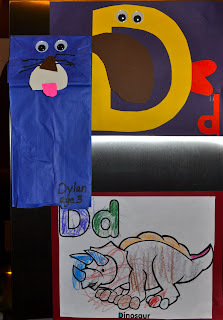 Grab a lunch bag, draw the face parts on construction paper- ears, nose, tongue, spots, bowtie, collar, etc.-for your "little" to cut out, glue on the puppy dog face and, doggonit, you're done! Now you've got yourself a doggie puppet! I'd like to know how much this doggie would sell for in the window? Priceless. Cut out ear shapes with white construction paper and tape on back of paper plate. Cut out black spots and glue on around face and ears. Glue eyes and pom pom nose, draw your mouth and tongue and you're done! Mix together cool whip and pudding and layer on top with crushed oreos. Top with a few worms and DIG in! 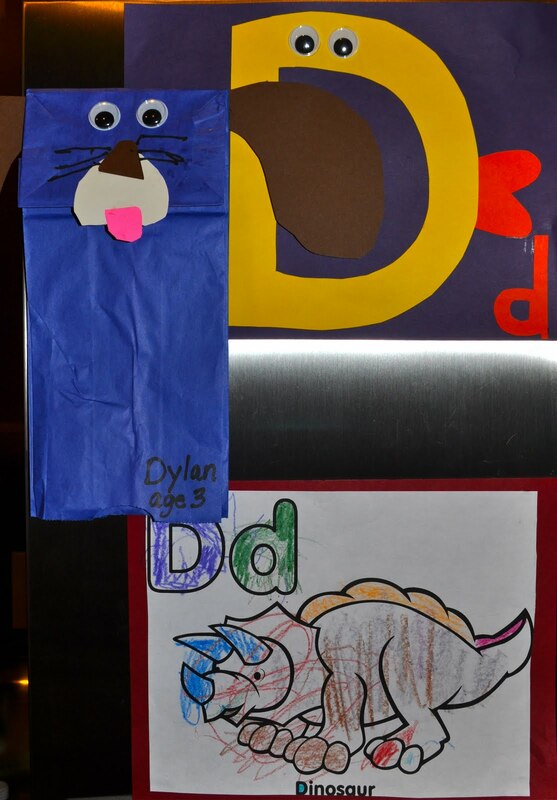 Letter Hunt: Your letter bucket is filled with dogs, ducks, deer, dinosaurs, dragons, dolls, dice, etc. Let your smartypants develop their fine motor skills by rolling playdough into the letter D. What else can they make with the playdough? A diamond? Maybe a dinosaur? "Little" Tip of the Week: Remember that your child gets excited when you do! Add excitement with facial expressions, praise, high-fivin', etc. It's great to see them so giddy about learning! It CAN be fun!